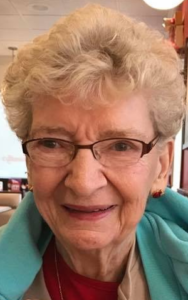 Helen J. Dochterman, 81, of Willow Street, died Thursday, January 24, 2019 at Evergreen Estates in Lancaster. Born in Wellsboro, PA she was the wife of the late L. Vernon “Doc” Dochterman who passed away in 2014 and the daughter of the late Curtis and Mary Elizabeth Mae (Dungan) Van Order. She worked for Schick, Hamilton Watch Co, and most recently at Burle Industries. Helen was a member of Grace Church at Willow Valley where she volunteered in many ways over the years, from hospitality to VBS to serving the staff to hosting missionaries in her home. She also enjoyed duck pin bowling and playing pinochle. Helen is survived by her children: Deborah Roe (Ellis) of Killeen, TX, Clinton Murray, Kim Denlinger (Rod) both of Lancaster, Janet Long (Theodore) of Willow Street; stepdaughter, Deborah Bosch, stepson, John Dochterman (Denise) both of Lancaster; 11 grandchildren, 11 great-grandchildren. A Memorial Service will be held at 11AM Saturday, February 2, 2019 at Grace Church at Willow Valley, 300 Willow Valley Sq., Lancaster, PA with Pastor John F. Smith officiating. Friends will be received following the service at the church. Burial will be private at the convenience of the family. In lieu of flowers, contributions in Helen’s memory may be made to the Arthritis Foundation, Central PA Chapter- SE Branch, 204 Butler Ave, Suite 102, Lancaster, PA 17601.